Raymond van Barneveld lost to both Daryl Gurney and Peter Wright last Thursday evening in Sheffield, and he has now been beaten in each of his last four Premier League matches. That run of defeats has seen Van Barneveld slip down the Premier League table to seventh place. He is three points outside the play-off places but has also played one game more than all of the players above him in the table. Barney’s average of 86.78 against Wright in Sheffield was his lowest average of the 2018 Premier League season. Overall, he has the lowest tournament average of all the eight remaining competitors in the event. Simon Whitlock was comprehensively defeated 7-1 by Michael van Gerwen last time out. The Wizard opened proceedings with a 14-dart winning leg, only then to see Van Gerwen chalk off seven winning legs in a row. His only win during his last seven Premier League matches came against Gerwyn Price. Despite that sequence of results, Whitlock is still only a point outside the play-off places. Whitlock has been suffering from illness over the last few weeks and pulled out of last weekend’s German Darts Open to give himself some recovery time ahead of this week’s Premier League double header in Rotterdam. Raymond van Barneveld’s chances of making the play-offs are very much diminishing and defeat in this match would realistically give him little hope of reaching the O2 in May. His confidence and motivation have both looked low in recent matches but a huge positive for Barney in this match is that he will be lifted by the support of a big crowd in his homeland which could well mean he rises to the occasion. Simon Whitlock has been on a poor run of results and the fact he has been struggling with illness certainly hasn’t helped his game. He is still very much in touch with the play-offs though, and a win here would certainly keep him in the mix for the top four. 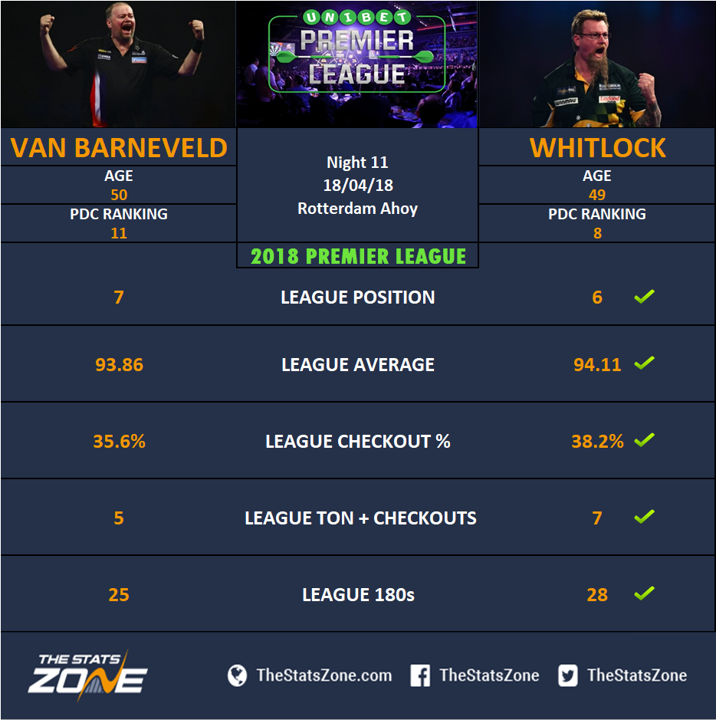 As poor as Barney has been recently, he is sure to lift his game with the support of a fervent Dutch crowd and if he gets off to a good start, he might prove too hard to handle for Whitlock.